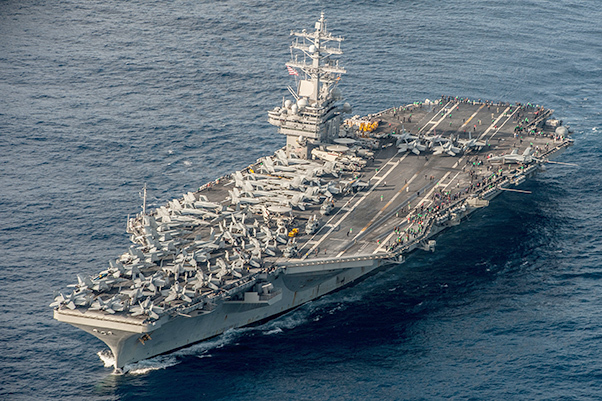 The aircraft carrier USS Ronald Reagan (CVN 76) is underway during Annual Exercise (AE) 16. The Ronald Reagan Carrier Strike Group is participating in Annual Exercise 16 to increase interoperability between Japanese and American forces through training in air and sea operations. 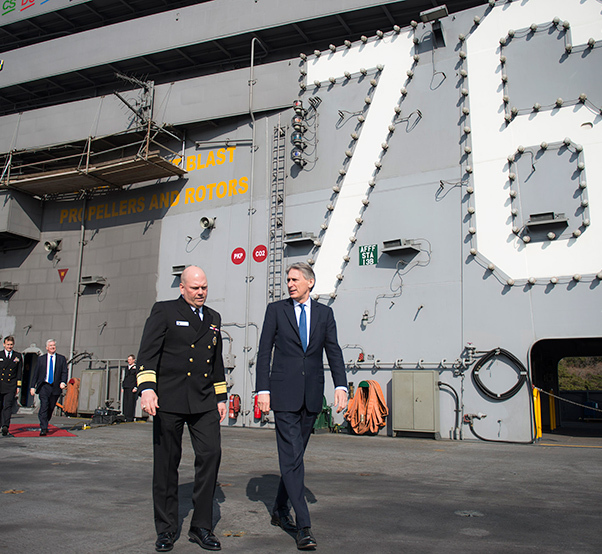 The U.S. Navy’s only forward-deployed aircraft carrier, USS Ronald Reagan (CVN 76), hosted nine officials from the United Kingdom Jan. 8. Rear Adm. John Alexander, commander, Battle Force 7th Fleet, and Capt. 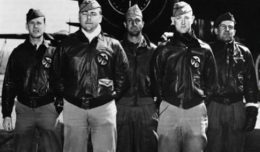 Brett Crozier, Ronald Reagan’s executive officer, welcomed aboard the Right Honourable (Rt. Hon.) Philip Hammond, Member of Parliament (MP), Secretary of Foreign and Commonwealth Affairs, the Rt. Hon. 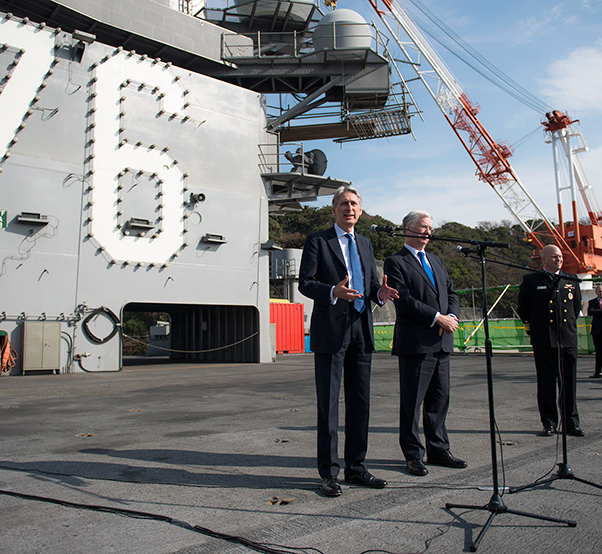 Michael Fallon MP, Secretary of State for Defence, and other delegates, and held a press conference on the ship’s flight deck. British Ambassador to Japan Tim Hitchens, Director, Asia-Pacific Stephen Lillie, and Director, General Security, Ministry of Defence, United Kingdom Peter Watkins, were also among those who visited Ronald Reagan. Rear Adm. John Alexander, left, commander, Battle Force 7th Fleet, and the Rt Honorable Philip Hammond MP, Secretary of State for Foreign and Commonwealth Affairs, walk toward a media press conference on the flight deck of the U.S. Navy’s only forward-deployed aircraft carrier USS Ronald Reagan (CVN 76). The United Kingdom’s Secretary of State for Foreign and Commonwealth Affairs and Secretary of State for Defense’s visit to Ronald Reagan reflects the strong relationship between the United States, the United Kingdom, Japan and their partners in the Indo-Asia-Pacific region. Hammond added the Asia-Pacific region is generating most of the world’s economic growth and is increasingly becoming important to trade, prosperity and security. Fallon continued that he hopes to deepen the cooperation and progress made during the past year in technology, high-tech specialist equipment, sensors, radars, helicopters, submarine, and air-to-air capabilities. During the conference, Hammond spoke about how the international community should respond to North Korea’s nuclear tests. The Rt. Honorable Philip Hammond MP, left, Secretary of Foreign and Commonwealth Affairs, and the Rt. Honorable Michael Fallon MP, Secretary of State for Defense, address media during a press conference on the flight deck of the U.S. Navy’s only forward-deployed aircraft carrier USS Ronald Reagan (CVN 76). The United Kingdom’s Secretary of State for Foreign and Commonwealth Affairs and Secretary of State for Defense’s visit to Ronald Reagan reflects the strong relationship between the United States, the United Kingdom, Japan and their partners in the Indo-Asia-Pacific region. The U.K.’s secretary of state for foreign and commonwealth affairs and secretary of state for defence’s visit to Ronald Reagan reflects the strong relationship between the United States, the United Kingdom, Japan and their partners in the Indo-Asia-Pacific region.